This was our first ever cruise, thought we would try, supposedly the best for my wifes 60th birthday. Wish we hadn&apos;t bothered. Arrive at Orlando airport, no rep to be found, having had a quick look round, I asked other reps, that were visible, in the obvious place, they told me Royal Caribbean had a desk downstairs. We found the rep, only to be told our transport had left with 2 couples that had got lost from an earlier flight, so through no fault of our own we were being expected to wait at the airport, after an 8 hour flight, for our transfer. They did get him to turn round, so only 20 mins waiting, however, there are now 6 adults in a seven seater, with my wife and I crammed in the back, with our hand luggage between us as not enough luggage space. Next morning about 30 of us in hotel lobby, waiting for coach transfer to ship, rep tells us coach is running 30 minutes late, coach eventually turns up, empty, so why late. Get to the ship, check in went smoothly, the ship is huge, we make our way to our cabin. The cabin was satisfactory, our sea view balcony was probably the best part of the whole holiday. The cabin did not have tea/coffee making facilities,which you get in 3 star hotels, so we go to guest relations, told you can order continental breakfast including tea, free, BUT $7.95 delivery, so not free, this was the first sign that this cruise is all about money. Every night they would try the hard sell of either expensive watches or expensive handbags. two nights were supposed to be formal nights, so off I go in my Tuxedo, only to be sitting next to a guy in the restaurant with shorts and sandals on, for the evening meal, again, I have been to 3 star hotels where "gentlemen" have to wear long trousers for the evening meal, I realised on the second formal night, that these nights were just another money making opportunity, with the ships photographers on every corner of every deck. For my wifes 60th, I booked us in to the steak "speciality" restaurant. If $45 each wasn&apos;t expensive enough, they had the cheek to charge 18% gratuity on top, even though I had pre paid gratuities, apparently you pay again in the over priced "speciality" restaurants. All my wife was given from Royal Caribbean for her birthday was 1 slice of cheese cake with a candle in, again I have been to 3 star hotels that leave wine and chocolates in your room, but Royal Caribbean, seem to be on the take all the time, giving nothing back to their guests. There is nothing outstanding about Royal Caribbean, or anything on this ship, was an expensive shopping trip. This was our first ever cruise, thought we would try, supposedly the best for my wifes 60th birthday. Wish we hadn&apos;t bothered. Arrive at Orlando airport, no rep to be found, having had a quick look round, I asked other reps, that were visible, in the obvious place, they told me Royal Caribbean had a desk downstairs. We found the rep, only to be told our transport had left with 2 couples that had got lost from an earlier flight, so through no fault of our own we were being expected to wait at the airport, after an 8 hour flight, for our transfer. They did get him to turn round, so only 20 mins waiting, however, there are now 6 adults in a seven seater, with my wife and I crammed in the back, with our hand luggage between us as not enough luggage space. Next morning about 30 of us in hotel lobby, waiting for coach transfer to ship, rep tells us coach is running 30 minutes late, coach eventually turns up, empty, so why late. Get to the ship, check in went smoothly, the ship is huge, we make our way to our cabin. The cabin was satisfactory, our sea view balcony was probably the best part of the whole holiday. The cabin did not have tea/coffee making facilities,which you get in 3 star hotels, so we go to guest relations, told you can order continental breakfast including tea, free, BUT $7.95 delivery, so not free, this was the first sign that this cruise is all about money. Every night they would try the hard sell of either expensive watches or expensive handbags. two nights were supposed to be formal nights, so off I go in my Tuxedo, only to be sitting next to a guy in the restaurant with shorts and sandals on, for the evening meal, again, I have been to 3 star hotels where "gentlemen" have to wear long trousers for the evening meal, I realised on the second formal night, that these nights were just another money making opportunity, with the ships photographers on every corner of every deck. For my wifes 60th, I booked us in to the steak "speciality" restaurant. If $45 each wasn&apos;t expensive enough, they had the cheek to charge 18% gratuity on top, even though I had pre paid gratuities, apparently you pay again in the over priced "speciality" restaurants. All my wife was given from Royal Caribbean for her birthday was 1 slice of cheese cake with a candle in, again I have been to 3 star hotels that leave wine and chocolates in your room, but Royal Caribbean, seem to be on the take all the time, giving nothing back to their guests. 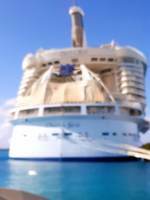 There is nothing outstanding about Royal Caribbean, or anything on this ship, was an expensive shopping trip.